The Oppo N1 is quite an interesting device with all the high-end specs and a particularly interesting camera which swivels from rear to front and the other interesting hardware feature is a rear touch panel which lets you do some pretty cool tricks. The hackers and tinkerers between us were quite delighted when Oppo announced that they would bring a special edition Oppo N1 pre-loaded with our favorite custom ROM, CyanogenMod. The first CyanogenMod phone, the Oppo N1 CyanogenMod Edition is now available. The smartphone is available at Oppo’s web store and it is priced the same as the regular Oppo N1 at $599. It is basically the same device with a 5.9-inch Full HD display, a 1.7 GHz Snapdragon 600 processor, 2 gigs of RAM. There’s 16 GB storage and a 3610 mAh battery. It features a 13-MP rotating camera and a rear touch sensor. If 4G LTE is important for you then sadly Oppo N1 does not have it. There CM 10.2 on top of Android 4.2 and the CyanogenMod Team has also made the source code and factory images of CM 10.2 available for download along with the source codde of the Android 4.4 KitKat based CM11 so that tinkeres bring early builds of KitKat for the N1. 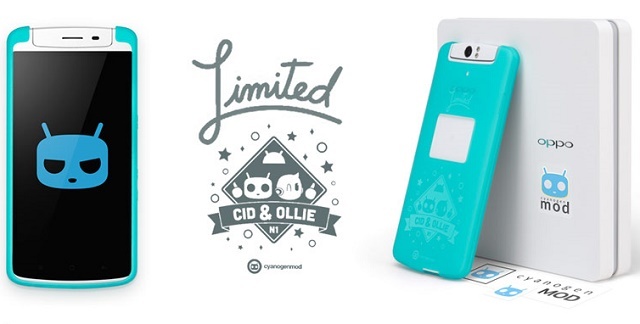 The Oppo N1 CyanogenMod Edition comes with a custom package and a CM branded case and there are also some cool CyanogenMod stickers as well. If you always wanted a smartphone pre-loaded with CyanogenMod then well, here’s your chance, hit the link below and get shopping and the device will ship in the new year.